Dan appeared on Good Morning America, Thursday, February 13th to discuss the on going trial of Michael Dunn, the man charged with shooting and killing an unarmed teenager. 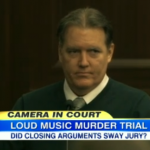 The jury deliberated for about 3 hours last night and continued the next morning. They have asked to see the surveillance footage of what happened that night. Says Dan, ” This is surveillance video from inside the station where you can hear the shots. The prosecution introduced this evidence. I think that is not something the defense is going to be particularly excited about because, when you listen to the shots being fired on that surveillance tape, you hear a pause. You hear the bang, bang, bang and then you hear another volley and that’s part of the problem here for the defense in claiming self defense. It’s not as if he shoots to keep the person away. It sounds like a volley of shots followed by another which again makes it problematic for self defense.” Watch the full clip here.